Versatile WEST SYSTEM Episize 6 oz. 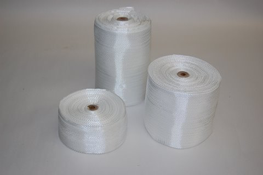 woven fabric tapes are ideal for reinforcing chines, hull/deck corners and similar structural applications. When bonded with WEST SYSTEM epoxy, they provide additional tensile strength to resist hairline crack development and abrasion. Woven glass fabrics are ideal for building composite laminates and repairing fiberglass structures. May also be used to provide an abrasion-resistant covering for wooden structures. When wet-out, the 6 oz. fabrics become transparent, allowing a clear, natural wood finish. Perfect for stripper canoes. May be painted or varnished.